Many are the masters who have deigned to bless this earth by their sojourn. Consciously or unconsciously human beings are wending their way towards divinity. They are on a long pilgrimage. These masters play the role of guides, leading the pilgrims along the intricate path. They infuse new life to the veins of the very pilgrims. They never preach what they have not practiced. Swami Chidbhavananda was one amongst those masters. Swami Chidbhavananda was the very embodiment of the qualities which he had attributed to the great masters. He was born on March 11, 1898 in a traditional agricultural family to Perianna Gounder and Nanjammal. Swamiji was the last of the seven children. Swami Chidbhavananda, a spiritual teacher of great eminence and a dynamic religious leader was initiated into the Ramakrishna order first as a Brahmachari and later as a sanyasin in the twenties by Swami Shivananda, popularly known as Mahapurushji Maharaj, a direct disciple of Sri Ramakrishna Paramahamsa. 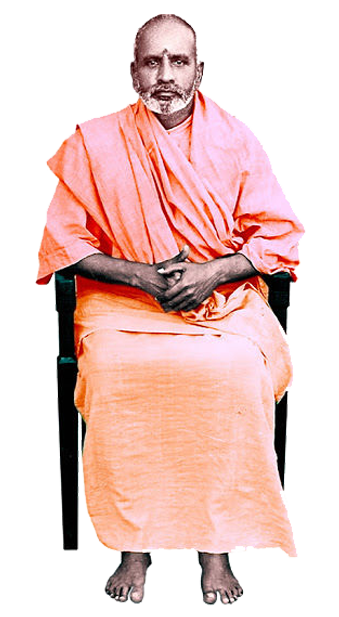 Swami Chidbhavananda was the founder of the Ramakrishna Ashram at Udhgamandalam and was the head of the ashram from 1926 to 1940. Then he established an organization in 1942 at Tirupparaithurai, a sacred temple town on the banks of Cauvery, 15 km west of Tiruchirapally town in Tamilnadu. It was here that Swamiji established the Ramakrishna Tapovanam and developed it into a great religious, cultural and educational movement, enveloping the entire Tamilnadu. 5 1918 Got 7th place in Senior Cambridge in Madras state. 7 1920 Impact of Speeches of Swami Vivekananda at Chennai lead to cancel education abroad. Meeting with Subbiah Swamigal. 8 1920-1923 B.A. Degree at Madras Presidency college - Contemporary friendship with T.S.Avinashilingam at Victoria Hostel. Entry to divine path. Visit to Sri Ramakrishna mutt, Mylapore, Chennai – blessed with Swami Sivanandar and Swami Brahmanandar. 10 1923 Reached Sri Ramakrishna mutt, Bhuvaneswar and lived with Srimath Akilananda Swamigal; Attained Brahmacharya Dheetsha from Swami Sivanandar –as Tirayambaga Chaitanyar Completion of BA Degree examination. 11 1924 With the blessings of Swami Sivanandar visit to South – meeting with Patriot VVS Aiyar – Meditation at Papanasam. Demise of VVS Aiyar by flood accident. 14 1926-1930 Service at Sri Ramakrishna Madam, Ooty. Became the President of Ashram at Ooty. Social-spiritual services to tribal people of Ooty. 16 1930 December Floor Relief Service at Chengalpattu. 19 1936 Centenary Celebration in a grand manner for Bhagavan Sri Ramakrishnar. Inception of basic school at 1000 pillar hall. Weekly Visit to Tiruchi Rock Fort Tayumanavar temple and conducted Discourse. Bhagavata Gita Discourses at ER School - Tiruchi, Karur and Salem. 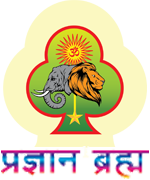 Establishment of Charity Health Care Centre. 26 1947 Elevation of Middle school to High school Honourable Chief Minister Sri Omanthur Ramasamy Reddiar unveiled the school buildings. 27 1950 Inception of a middle school (day scholar) for Tirupparaithurai nearby villages. 29 1953-1954 Centenary Celebration of Annaiyar Sri Sarada Devi Donated 1 Lakh for establishing Sri Sarada Madam at Calcutta. 30 1955 Establishment of Sri Ramakrishna Ashram at Courtallam; conduct of spiritual retreat for devotees. 31 1956 Introduction of Sri Sarada Vidhyalaya for women and other women institutions at Salem. 32 1955-1964 Visit of Dr A.L. Mudaliar, the Vice-chancellor of inaugurating the BEd college. Establishment of BEd College at Tapovanam. Elevation of Tapovanam Middle school to High school. 36 1964 Spiritual discourse for social transformation at Bhagavathy Amman temple, Kanniakumari. 38 1971 Establishment of Vivekananda College under Gurukula system ( A Life Training Institute) at Tiruvedakam west, Madurai dt. 39 1973 Dedication and delegation of Cheranmahadevi VVS Aiyar’s Bharadwaj Ashram and Advaita Ashram at Salem to Tapovanam. 40 1976 Establishment of Sri Ramakrishna Ashram at Pannaikadu, Dindigul district. Summer Study School for Gurukula students. 42 1979 Visit of Italian Priests to take training with Swamiji; Inauguration of Narendra Kazhi Koodam (Nursery) at Tiruvedakam and Vivekananda Higher Secondary School at Tiruvedakam west. 43 1980 Dedication of Mukundarao Choultry, Rameswaram to our Swamiji. Inception of Sri Ramakrishna Madam. 46 1985, August Health deterioration – Strict adherence to spiritual system. 47 1985 August – November Blesses the visiting devotees with "Be Blissful" i.e ANDAMAGA IRUNGAL. 49 16-11-1985 Attained Maha Samadhi.